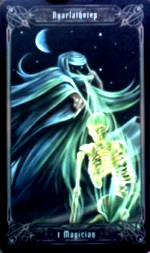 The tarot is mathematically linked to every moment in time, it is a powerful tool for divination and also spell casting. Egyptian witchcraft is not only the oldest witchcraft, it is the fountainhead of all magic, its source and therefore the most powerful. You may use The Magician - Nyarlathotep, Black Magic Egyptian Tarot Spell for victory, control, manipulation, transformation, attainment and entrapment. To cast this spell the spell caster enters an altered state of consciousness, and enters the outer world, once the magician is walking in the realms of angelic spirits he can cooperate with them to change the patterns of creation. Changes are made via thought and controlled by thought, the new reality then filters down from the outer world to manifest on the material plane. To cast this spell we need any names, dates of birth, addresses, phone numbers, photos or other information you can supply. We do not need all this information, but whatever you know, so we can build up a picture of your situation, then your case will be scrutinised psychically by Andrea using using the Necronomicon Tarot which instead of using conventional interpretations, connects with the cosmic forces overshadowing the world, and tells you what will happen, not what may happen. 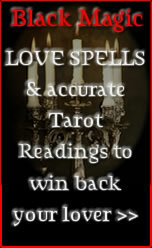 This enables a spell to be accurately charged, leaving no stone unturned. Nyarlathotep Victory Black Magic Egyptian Tarot Spell & READING by Andrea. Price £400.00 British Pounds Sterling. Or visit our ORDER PAGE for more information.